Eclectic Paperie: Lets get Messy with a Mixed Media layout . 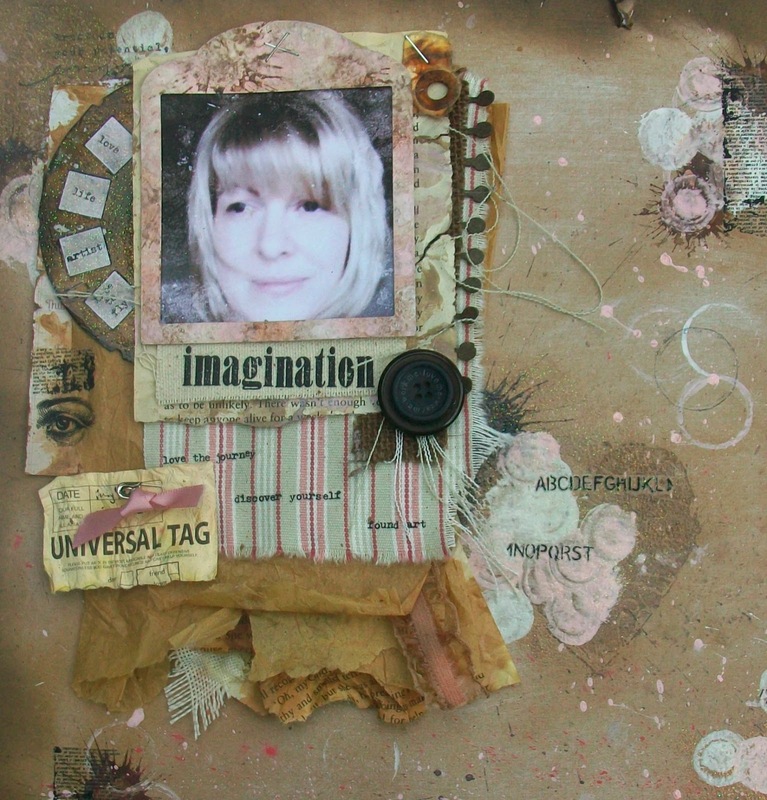 . .
Hi everyone, Tracy here today with a Mixed Media layout using some yummy goodness from the eP Shop along with a little of this and a bit of that. Soooo, hands up if you looove to get all messy! Yeah, I can see you all and guess what? Eclectic Paperie has a challenge going on right now hosted by the lovely Mary Ann and the theme she has chosen is . 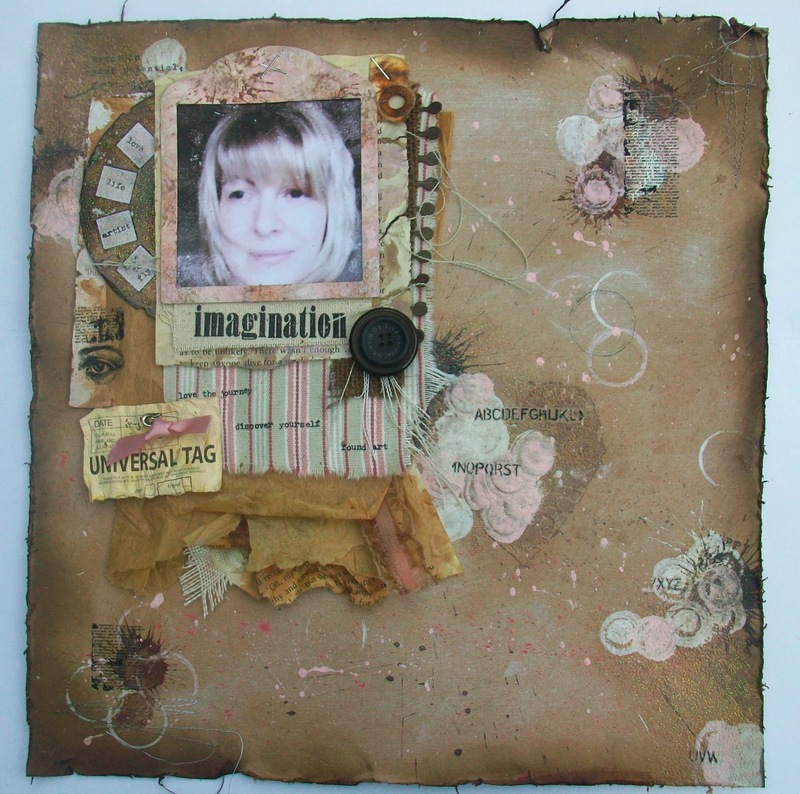 . .
" Bringing it on "
Yep, Mary Ann is challenging all you mixed media fans to bring it to a layout, check it out HERE! A list of materials with links can be found at the end of this post. white Pan Pastel to give a more muted look to the background . . .
. . . see the difference it makes.
. . . once I started I couldn`t stop . . . Still I wasn`t finished yet . . . out came my sewing machine for some wonky tonky stitches, roughed up all the edges and added embossing powder for more texture. Time to pop the background to one side and layer up a focal point! 7 Gypsies Travel paper pack ... swooooon moment ... yes Kim has products from7 Gypsies in the store! Along with some odds and ends I came across in my stash. 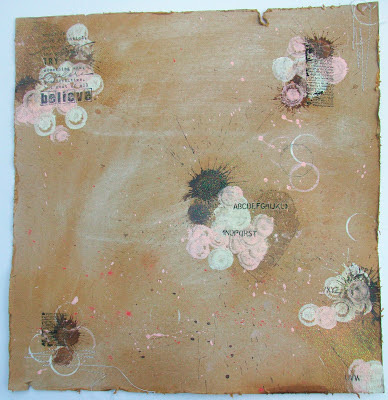 Here`s a closer look at the remnant rubs on the materials and the tissue paper ... love the eye rub on. I rooted around my stash for pink, black and neutral tones, made up into layer after layer until I was happy with how it all looked, then I fixed it all together with staples and a hot glue gun. Fixed it onto the background, added a little Walnut Stain Distress ink with a blending tool all around the edges to age it even more. Finished and my hands could tell you a story seeing as they are now all ink and paint splattered! A shout out again to Mary Ann for such a great challenge and I hope you enjoyed my post. It would be great to see you all join in . . .go on, go get MESSY!!! Kim also has Tim Holtz Kraft Core in stock in 6x6 paper pad here. 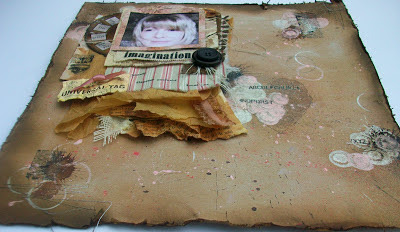 Such a fun page, great idea to add mixed media to our scrapping! 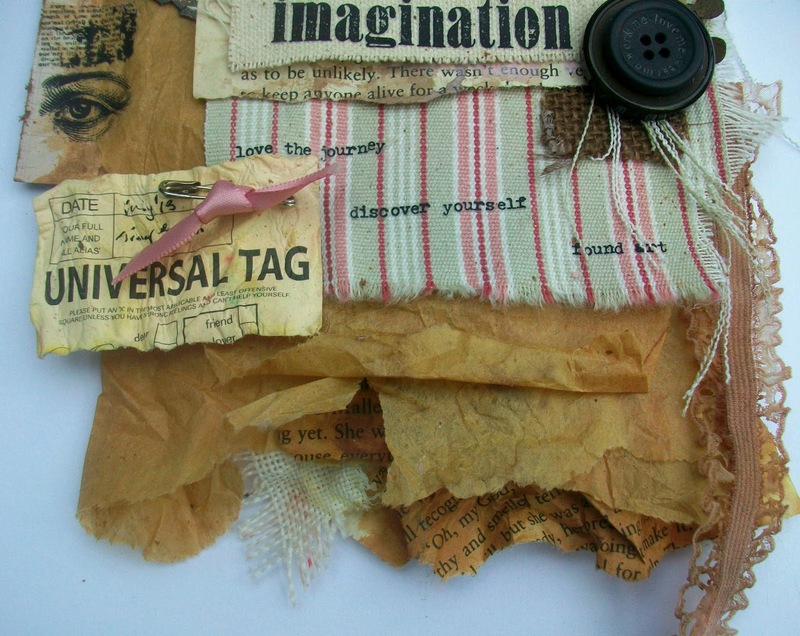 Love the 'splats' and all the lovely layers of tissue, fabric and paper! Those layers are amazing, Tracy! Love the paint spats too...Great stuff! Ohhhh didn't even think to use kraft core with pan pastels..... love your splatters and love all those yummy layers. Awesome layout. Gorgeous Tracy, I love how you incorporated the tissue paper, and all those wonderful layers and splatters. Fabulous! Tracy, this is so cool. 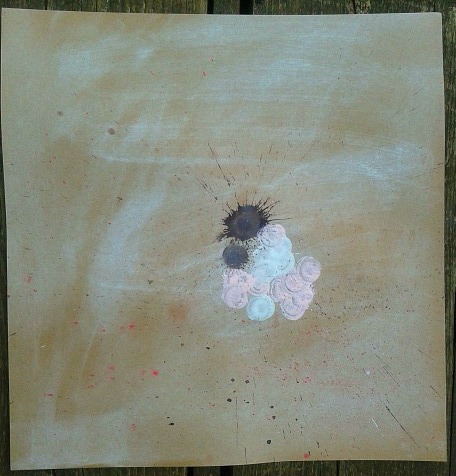 I love the splats and splatters on the background. 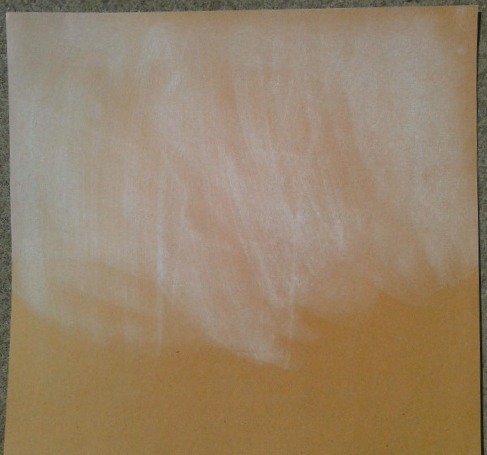 Great idea to use the white pan pastel to tone down the kraft. The stack of tissue, papers, and photo is amazing. Love the stitching and the wonderful textures you have included. Your explanations are always so fun. 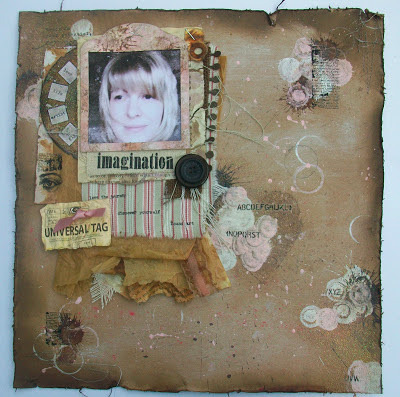 Fabulous, Tracy... it has such freedom and spontaneity, and I love that stitched bundle of layers - fantastic. oh, Tracy, this is just amazing. Love the color palette and all of those layers! The wheel with the remnant rub words is perfect. Really fabulous layout. This is gorgeous. Love the step-by-step. Thanks for posting your work.